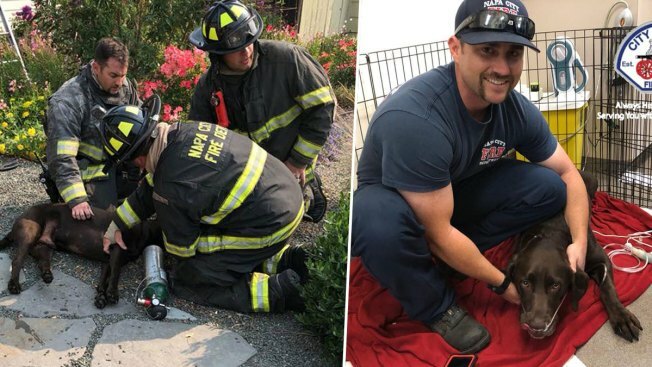 Firefighters on Monday rescued a dog from a house that caught fire in Napa, according to the city's fire department. Max, a chocolate Labrador retriever, is said to be "doing well" after he was saved from the burning house along Sheridan Drive, the department reported. Firefighters were able to save Max thanks to so-called "Fido Bags" donated by The Fetch Foundation, according to the fire department. The bags contain special masks that can fit over a pet's muzzle and provide them with life-saving oxygen. A photo snapped during the rescue showed Max lying down on the ground outside the house as first responders worked to save him. A second photo shared the following day captured Max, who appeared to be hooked up to an apparent assisted breathing machine, hanging out with one his rescuers. Scott Sedgley, a retired Napa Fire Department captain and current city council member, happened to be in the area of the fire and rushed to help, according to the fire department. He opened a back door to allow a second dog to escape and also tossed a garden hose into a window to slow the spread of the fire.